U.S. Forces Korea Commander Gen. James Thurman said Tuesday he has asked the Pentagon and the Joint Chiefs of Staff to send one more squadron of attack helicopters and bolster the missile defense capabilities of the USFK. Thurman was speaking at a forum hosted by the Association of ROK Army. "In order to enhance war-fighting capabilities, I have asked for prioritization to receive an additional attack-reconnaissance squadron to bring to our combat aviation brigade," Thurman said. "And I have asked for increased capabilities in terms of theater ballistic missile defense." He was referring to a squadron of AH-64 Apache attack helicopters that had been deployed to South Korea but was sent to Iraq during the war there and has not returned, plus PAC-3 patriot missiles capable of intercepting North Korean ballistic missiles. Since 2004, the U.S. has cut troops and equipment on the Korean Peninsula, including two attack helicopter squadrons, but insisted that there would be no vacuum in military strength due to other weapons and troops. 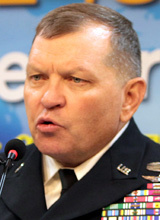 Thurman, who has a reputation as a frontline commander, was appointed head of the USFK in July last year and has completely reassessed American troop strength here. He has apparently concluded that there is a weakness in U.S. military capabilities to deal with a coastal assault by North Korea on the West Sea islands, as well as attacks by long-range artillery and ballistic missiles along the demilitarized zone. "Since Kim Jong-un's rise to the leadership, the threat of a North Korean provocation has increased, and so have Washington's concerns due to the upcoming transfer of wartime operational control" of Korean troops to Seoul in December 2015, said a South Korean military official. "These factors played a role in Thurman's request for the additional Apache squadron, but there is no reason to believe that there are worrisome movements by the North Korean military." The USFK operated three Apache squadrons in South Korea or 72 helicopters, but two squadrons were deployed elsewhere in 2004 and 2009.